As the winter weather gets colder and harsher by the day, Syrian refugees are struggling to survive the rough conditions with the limited resources they are provided. Syrian refugees have been displaced from their homes for over three years now, finding refuge in neighboring countries due to the ongoing civil war in Syria. But, the provided inadequate resources have endangered their mortality as many struggle to overcome the brutal winter storms with the thin layers of clothing they brought and no heat for warmth. 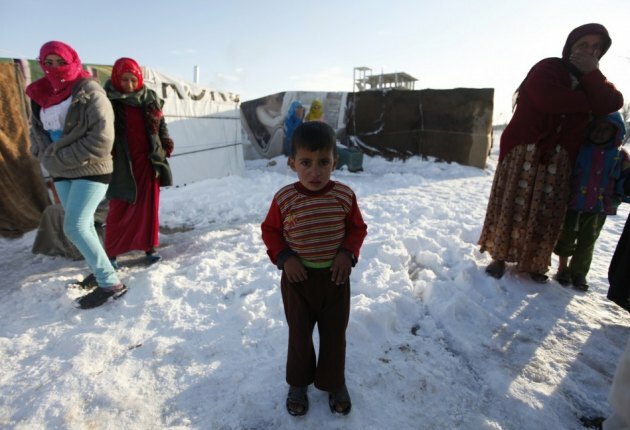 In Turkey where about 1.6 million of the refugees live, the temperature has dropped to below 0. Although the government is providing some of them shelter and food in its 22 camps, its assistance is only limited to the camps which leaves many who live outside the camps to survive on their own. In Lebanon which has about 1.15 million Syrians refugees, four people have died from the severe weather in recent months. Their shelters consist of poorly constructed tents that do not prevent the storms from destroying them. Many are forced to use their remaining possessions such as their beds to protect the tents from collapsing. These conditions, however, are nothing new and have been going on since the beginning of the refugees’ exodus in 2011. When finding refuge in the neighboring countries, Syrians were forced to deal with the same poor conditions described above. They were provided with tents as shelter, rationed food and poor heating. The winters brought danger to their health as many Syrians didn’t have enough clothing. The only difference between then and now is that the number of refugees in the host countries is increasing dramatically as in 2012 it was estimated to be 440,000 and now it is at 5 million. Many of the host countries cannot provide enough resources to all these people when they have to worry about their own citizens. The neighboring countries are not the only ones who have spent all their efforts. The U.N., which was involved heavily in helping the refugees last year, is now focused on providing for only the refugees who are living in remote regions because of its meager funding. UNICEF is asking for donations that will amount to $500 million, hoping that this fund will help with the food, shelter, and medicine. As the civil war continues, it is unlikely these refugees will be able to go home anytime soon. What started as a pro-democratic rebellion against the Syrian government has now evolved into a bitter civil war between Islamic radicals like the Islamic State, secular rebels, and the Syrian government. Although the UN and Arab League have formed a solution to the civil war, it was rejected by Syrian government as it would require it to meet the rebels’ demands.